On Monday 15th April, Dublin City University will host a special opening event entitled ‘Accessing your Future Talent,’ to celebrate the launch of the new DCU Access to the Workplace Programme. The DCU Access to the Workplace Programme is a pilot scheme initiated by DCU in 2019 to give 50 Access students the opportunity to find an internship in established workplaces this summer. Guests will be treated to a keynote address from Sandra Healy, Head of Equality, Diversity and Inclusion at DCU. Sandra will discuss how building a culture of diversity and inclusion can help employers to identify and meet the talents and skills that will be required in the workplace of the future. Sandra’s address will be followed by a panel discussion with Professor Brian MacCraith, President of DCU, Paul Kiernan, Talent Acquisition Lead with EirGrid, and Emma Lockwood, DCU Access graduate and former EirGrid intern who will be able to share their first-hand experiences of the benefits of programmes like Access to the Workplace to an employer, an employee and the University. The panel will be chaired by Jason Sherlock, Associate Director with DCU Educational Trust who, with the help of Fiona Hudson and Cathy McLoughlin in the DCU Access Service office, were instrumental in the establishment of the programme. “We are delighted to host this launch event which will provide insights for all companies hoping to build a culture of diversity and inclusion in their workplace and we look forward to discussing how initiatives like Access to the Workplace can help companies to realise this goal. 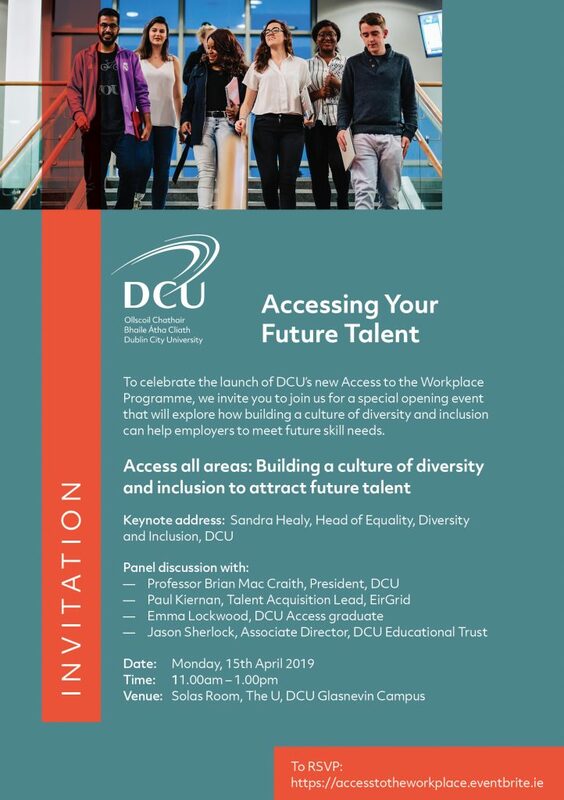 The event is open to any individuals or companies with an interest in diversity and inclusion in the workplace, or those wishing to learn more about the DCU Access to the Workplace programme. For more information, please see below, or click here to book your place today. Sandra Healy is Head of Equality, Diversity and Inclusion at Dublin City University. Before moving to DCU, Sandra held a number of leadership positions spanning 20 years in the telecoms industry across both the UK and Ireland. Sandra leads DCU’s Centre of Excellence for Diversity and Inclusion which provides access to the very latest in academic research, insights and tools on workplace diversity and inclusion and supports organisations in all aspects of their journeys. Sandra holds an Honours Degree in Psychology and a First Class Masters in Organisational Psychology from DCU. She is an NLP Master Practitioner and Sales Academy Coach, with expertise in delivering large-scale business transformation, building high performing teams and delivering cultural change. Over the past ten years Sandra has championed and driven Diversity and Inclusion practice in Irish Industry and contributes hugely to the work of the Ibec Diversity Forum, CWIT and 30% Club Ireland. Sandra is currently the Education advisor for CWIT (Connecting Women in Technology). Sandra was ranked number three in the Diversein 20 Diversity Leaders to Watch in 2018 list and was also Shortlisted for the European Diversity Awards 2018 – Head of Diversity of the Year.